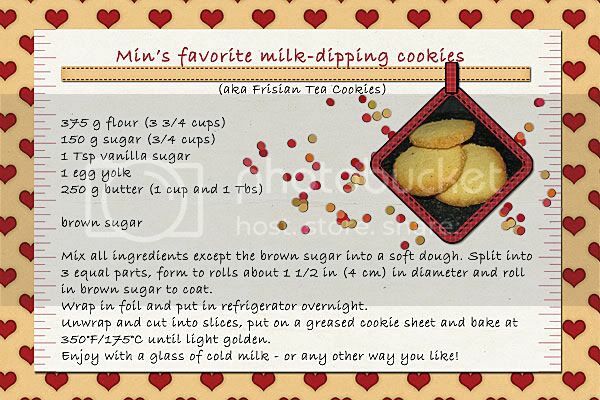 Ooooh – there’s a wonderful yummy new kit in my store: Baked With Love, a collab between Deli Scraps by Min, Kimberkatt Scraps, MoonDesigns, and SKrapper Digitals. The kit and both bundles are DOTD today at theStudio – for 70 % off (gasp)!!! Thank you so much for this post. I want to let you know that I posted a link to your blog in CBH Digital Scrapbooking Freebies, under the Page 2 post on Jul. 28, 2011. Thanks again. Thank you for the recipe and the card!